The TV7-117 turboprop engine was developed to power commuter aircraft (45-65 passengers). By efficiency it is one of the best world engines of its class. The high fuel economy is provided by high parameters of the thermodynamic cycle (compression ratio - 16, turbine inlet temperature - 1500K) and by high efficiency (compressor efficiency exceeds 81%, compressor turbine efficiency exceeds 88%, free turbine efficiency exceeds 92%, complete combustion chamber 0.99). The engine features a large margin of gas dynamic stability. The engine design is modular and it incorporates 9 modules. Additional balancing is not required for the modules replacement and it may be carried out at airport area. The engine employs two channel full authority electronic control system; and hydromechanical control which provides completion of the flight when electronics fails. Independent airborne control system provides the parameters check, displaying trouble data and recommendations on trouble correction. The system also provides the engine prompt ground post-flight inspection. The engine features long service life, maintenance simplicity and high repairability. At present two modifications of this engine are developed: TV7-117S for Il-114, TV7-117SD for An-140) and TV7-117SV for MiG-110). 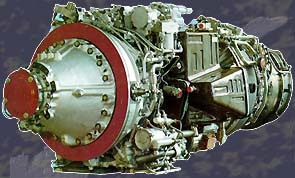 TV7-117 engine and its variants are certified for operation in the CIS countries since 1997.
coaxial propeller gearbox arranged in front of compressor.